When I first arrived to the West Point Band as a clarinetist in 2004, I was jokingly told by many of my new coworkers that the only two things I really had to know were: A) what time to show up, and B) what uniform to be wearing. I say jokingly because I thought they were just being funny, but it turned out to be at least partially true, especially where uniforms are concerned. Behind the scenes as a military musician, while there may be an occasional, “I’m nervous about playing that solo,” there are ten times as many comments like, “Does anyone have an extra set of medals?” “Are we in white or blue pants for this?” or “Where is my belt?!? !” I can personally attest that my most frightening moments of the job had nothing to do with performing music, but more with the times I was clumsily fumbling with a tangle of white cords on my marching uniform with only two minutes left to get into formation, or the sheer terror I felt once when I was almost to the parade field and realized I forgot my white gloves. Uniforms are obviously very important in the military. They encourage unit cohesion, and distinguish us from other military branches, other countries, and other even other units. Not only do the uniforms look impressive, but the various insignia, medals, patches, and stripes convey a variety of information about our military careers. When the band is out performing for the public, people ask us questions about our uniforms almost more than anything else. When the band is rehearsing and doing our day-to-day work, we wear the regular duty uniforms of the army—either ACU’s or ASU Class B’s mostly. 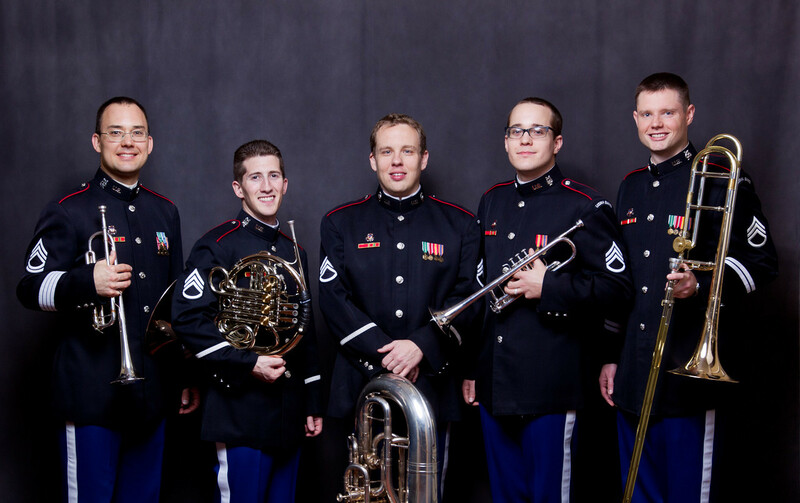 When it comes to performances, we each have a locker full of mix and match uniform parts that come together to create our dress uniforms, both for concert and marching. These uniforms are specific to the West Point Band and have evolved throughout the band’s near 200-year history to become the uniforms you see today. Our Concert Blue and Full Dress Blue uniforms, which you will see below, were modeled to resemble the cadet marching uniforms, and have been around more or less in their current form since 1902. The Concert Blue uniform is probably the most recognizable, as it is the one in which we perform most of our sit-down performances and concerts. It consists of our dark blue high collar coat, complete with medals, over blue pants. In concert settings, the females can also choose to wear a long blue skirt instead of the pants. This uniform is also used for marching funerals and occasionally other outdoor ceremonies, in which case we will wear white gloves and our flat blue hat as well. (It probably goes without saying, but skirts are not an option for marching.) Our high collar coat is the most distinctive part of our uniform, bearing the “USMA Band” patch on the shoulder. The dark blue color represents the “Army Blue,” and the red piping is a remnant of the red used in the uniforms of the Continental Army. A closer look at the high collar coat—What are all of the stripes and patches? Most of the questions we get are directed at deciphering the stripes, patches, and medals on our high collar. On each of the sleeves towards the cuff, individuals will have a certain number of white stripes. These are service stripes, and each one represents three years time in service. So if you see someone with no stripes, they have been in for under three years. Likewise if you see someone with stripes up to their elbow, they have been in the band a very long time. On our sleeves near the elbow is a patch displaying our rank. 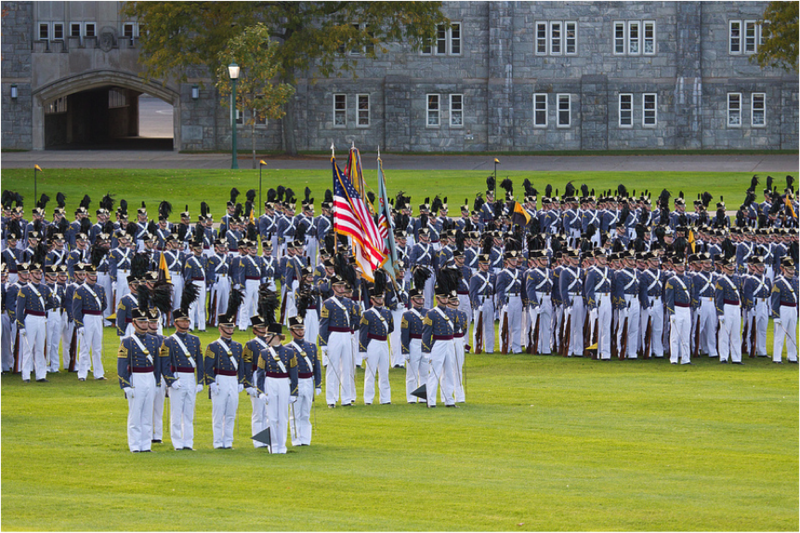 The members of the West Point Band are all NCO’s (with the exception of our conductors who are officers, and whose rank is displayed on their shoulders), and rank from E-6 (Staff Sergeant) to E-9 (Sergeant Major). On the left side of the uniform are two unit awards, with the Adjutant General Regimental Crest above. The AG crest signifies that the band is a part of the US Army Adjutant General Corps, which is a branch of the US Army first established in 1775. The red ribbon is the Meritorius Unit Commendation, which was awarded to the West Point Band in 1946 for uncompromising performance of its duties, including playing for the FDR Funeral held on April 15, 1946. 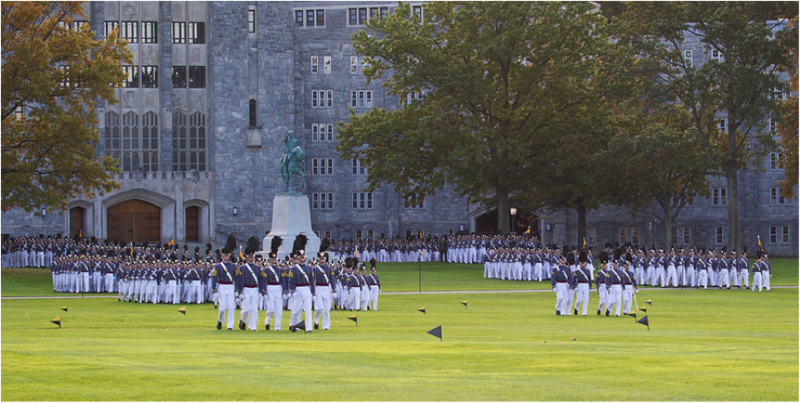 The red and green ribbon is the Army Superior Unit Award, which was awarded to every unit on West Point in June of 2010 for national recognition of the academy being named “The Best College in America” by Forbes magazine, and “The Top Public Liberal Arts College” by U.S. News and World Report. Another picture of the Concert Blue uniform. On the right side of the uniform are the individual’s service awards and personal decorations, which serve to display the highlights of a service member’s career. 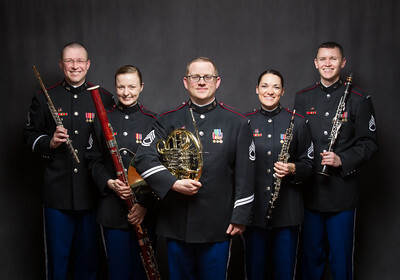 All band members have the National Defense Service Medal (the red and yellow medal), and the Global War on Terrorism Service Medal (the blue medal). The former is awarded to any member of the US Armed Forces who served honorably during distinct periods of “national emergency,” including the Korean War, Vietnam War, Operations Desert Shield and Desert Storm, and the Global War on Terrorism. The Global War on Terrorism Medal is awarded to any service member who has performed service during the War on Terror, from September 11, 2001 until a date yet to be determined. Other medals depend on an individual’s accomplishments. Click here see a list of all of the Army’s awards and decorations. 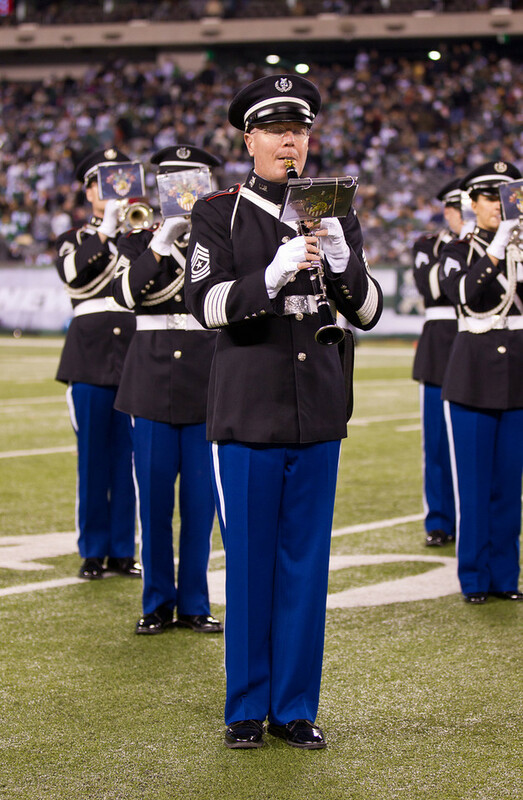 The Sierra uniform is used for performing in warm weather, for either concert or marching settings, and sometimes football games. It may not be the most comfortable of uniforms, but it can be a huge relief to wear short sleeves on a hot day instead of roasting inside the high collar. Sierras consist of a white, short sleeve button down shirt, black belt, and blue pants. The shirt is similar to the Class B every day shirt; on it we wear our nametag and shoulder boards with rank (although it is white instead of gold). However, unlike the Class B shirt, we also wear our medals on this shirt. The headgear for this uniform is the flat white hat. 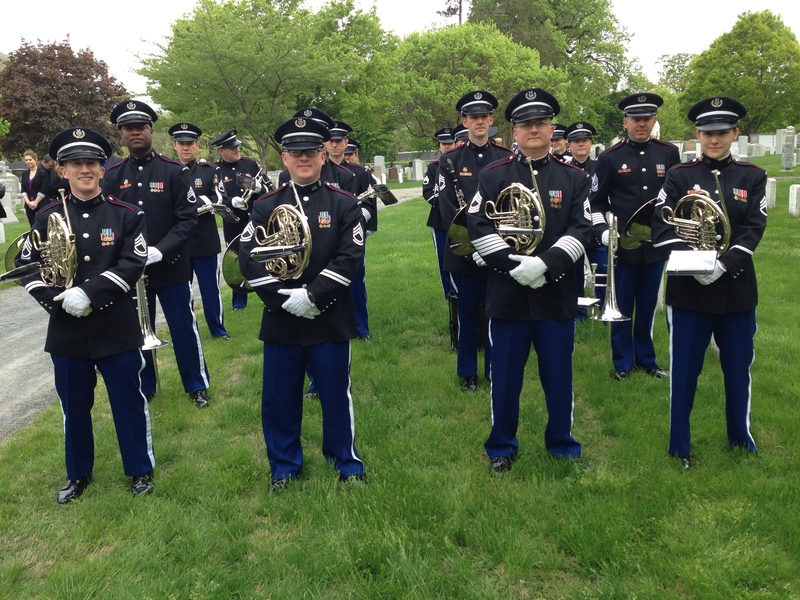 We wear this uniform for our summer outdoor concerts, as well as for some of the warm weather military reviews. The Band wearing the Sierra uniform while performing at Michie Stadium. This is by far the most intricate and ornate uniform, and the one that is hardest and most time-consuming to put together. Even seasoned band members can forget what goes where by the time parade season rolls around again. The full dress uniform starts with the high collar coat (but without any medals), over blue OR white pants. The reason we don’t wear medals on the high collar is to make room for the black wool pouch that goes over our right shoulder, the braided white cords, and the white belt. With this we also wear white gloves, and a hat we affectionately refer to as our “tar bucket.” The tar bucket bears the USMA crest and a tall black plume. 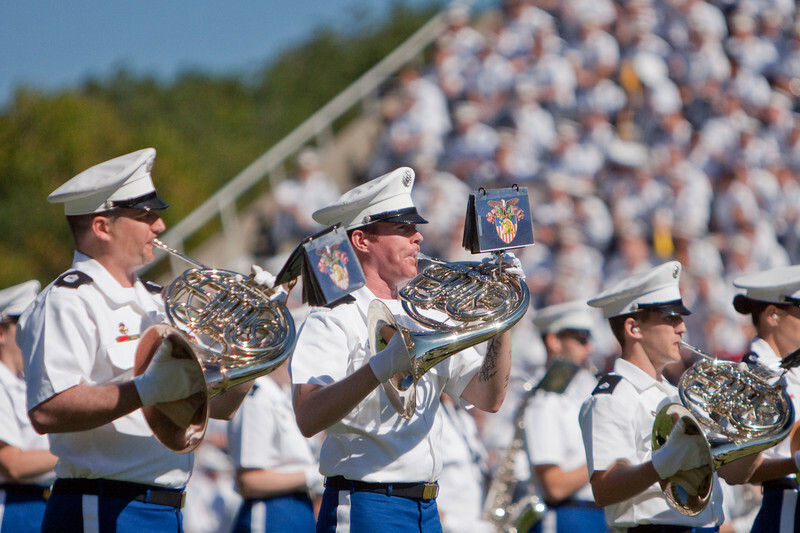 We only wear the full dress blue uniform for reviews and sometimes football games (although we save the tar bucket for marching on the field, and opt for the more sensible flat blue hat for playing in the stands). Dress Blue over blue pants at MetLife Stadium. How do we decide which uniforms to wear? 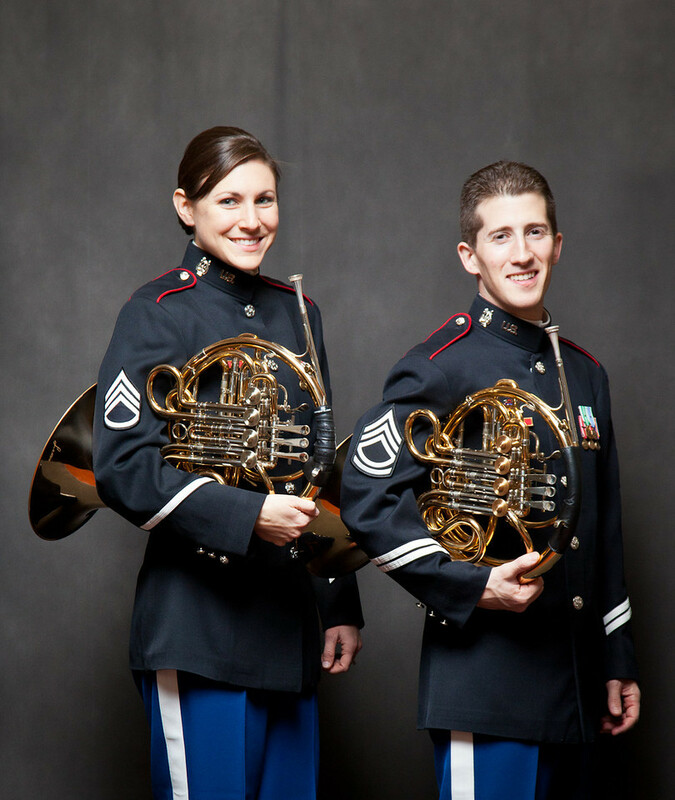 For the band’s own events, such as concerts, we generally wear the Concert Blue uniform for indoor concerts, and the Sierra uniform for outdoor concerts. However, in ceremonies and events in which the band plays a supportive role, we usually wear a uniform to match everyone else. For instance, for formal events in which participants wear the Class A uniform, we will wear our Concert Blue uniform. For ceremonies in which everyone is in ACU’s, we will also wear our ACU’s. For any event involving cadets, such as reviews and football games, we will wear equivalent uniform of those the cadets are wearing. Reviews are usually either done in Full Dress Blue or Sierras, as are the football game marching shows that we do. 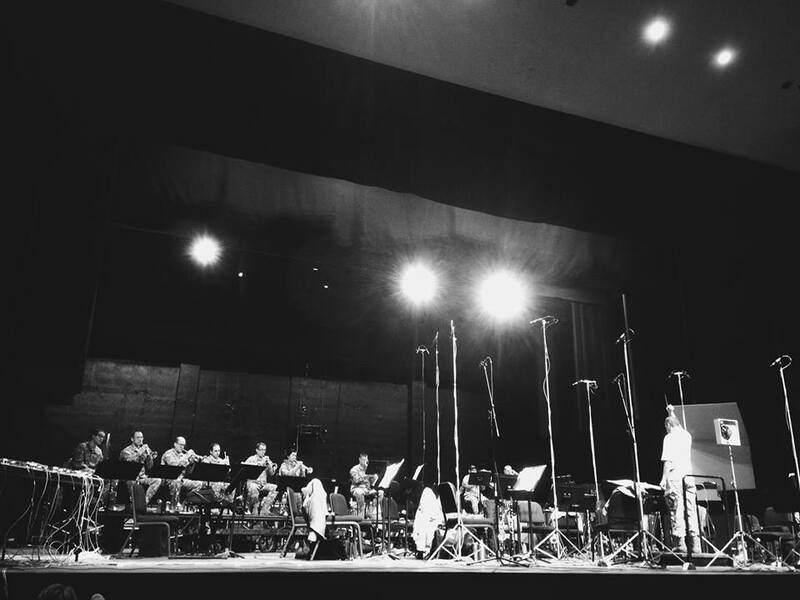 It’s often said that the audience “hears with its eyes,” and we in the band experience this firsthand all the time. Before we play a single note, people form impressions based on our uniforms. 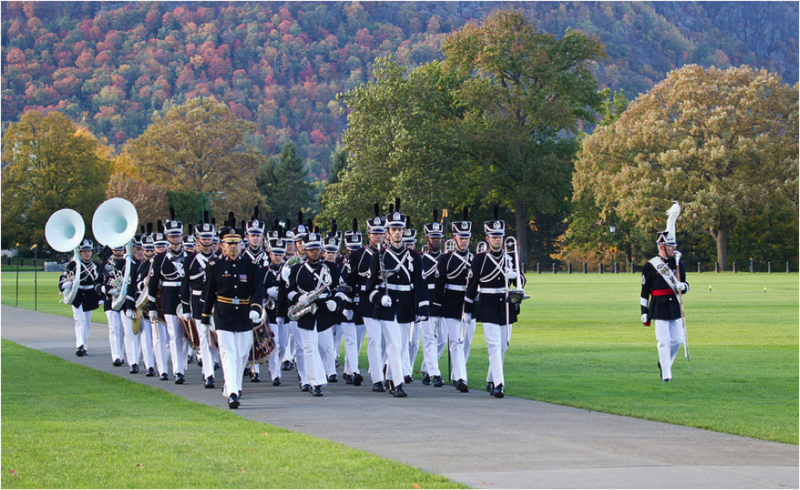 We are proud to serve in the uniforms of the United States Army, and hopefully this has given you a better understanding of our uniforms here in the West Point Band. 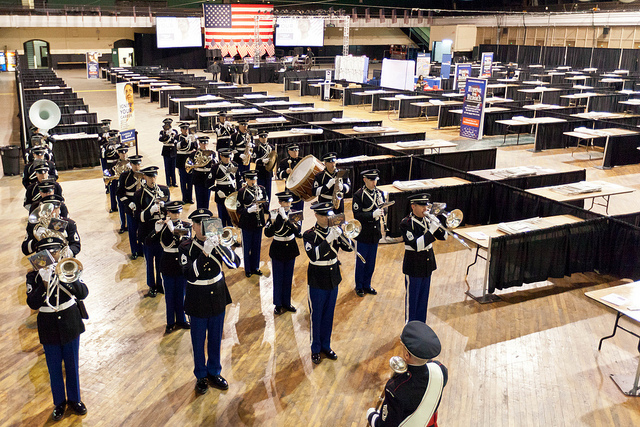 The West Point Band recently performed for the “Hiring Our Heroes” job fair in New York City. Launched in 2011, “Hiring Our Heroes” is a nationwide initiative to help veterans, transitioning service members, and military spouses find meaningful employment opportunities. It’s the third straight year we’ve participated. The last two years we appeared on NBC. This time, Fox and CBS picked it up. Anyway, it’s an interesting day and I thought it would be fun if I documented it. By keeping track of exact times on my iPhone, that’s what I did. Enjoy! 3:28am: I wake up two minutes before my alarm is set to go off. 4:10: I leave my house with a travel mug full of 20 ounces of coffee. It is black and strong. I also cue up a “Radiolab” podcast to keep my brain occupied before the caffeine kicks in. 4:31: I arrive in Ridgewood, NJ only one minute late. I view this as a small victory for me. I am here to carpool with a friend from work. From his street, I can see Valley Hospital in the distance. This is where my daughter was born nearly two years ago. 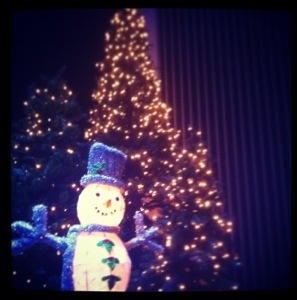 The memory makes me very happy. 5:28: We arrive at the site of the event, the Lexington Ave. Armory. It’s a historical building completed in 1906 that today houses the U.S. 69th Regiment. Other members of the band begin trickling in. 6:03: Everyone from the West Point Band has arrived. We are served breakfast. There are pastries, muffins, bagels, and fruit. All of it looks delicious. I decide that I need to load up on calories if I am to get through such an early morning. This is my rationale as I pile large amounts of food onto my plate. 6:30: We begin changing into our uniforms for our first TV spot. I am relieved that I successfully packed every part of my uniform. I feel this relief despite quadruple checking everything the night before. 7:00: We begin filming our first television spot. We perform America Exultant. I feel nervous as the camera comes on. My respect for those who work in television is at an all-time high. 7:30: Another TV spot. This time we play The Stars and Stripes Forever. For this take, a cameraman is walking through the band as he films. I successfully play a high note towards the end right as the camera walks by me. 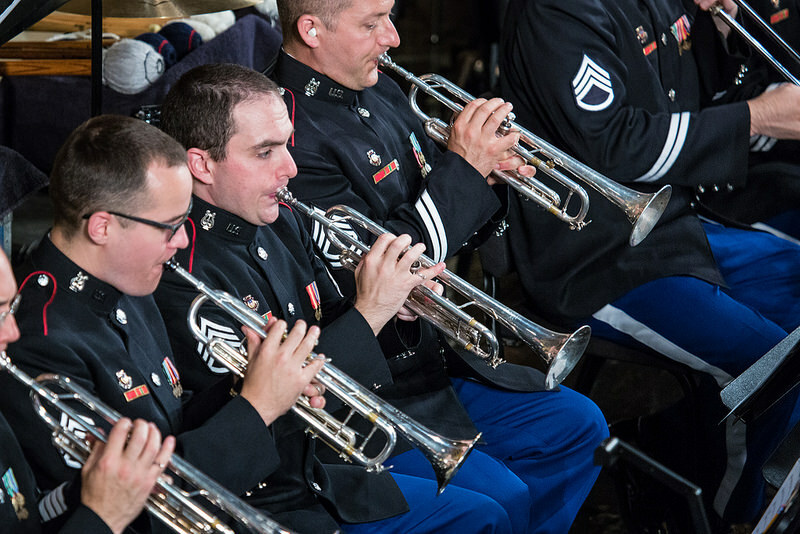 In the moment, I imagine trombonists and veterans everywhere feeling inspired as they watch the broadcast. 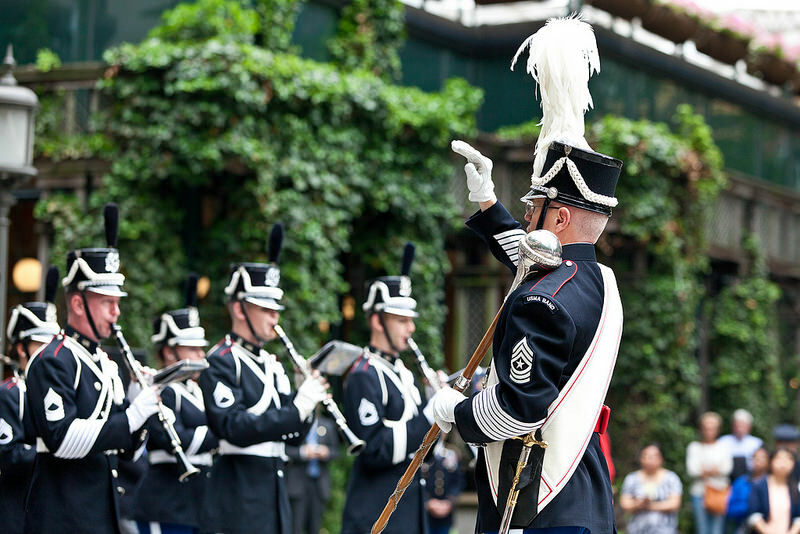 The West Point Band performing at “Hiring Our Heroes” in New York City. 8:00: We perform Carmen Dragon’s famous arrangement of America the Beautiful for our third spot. 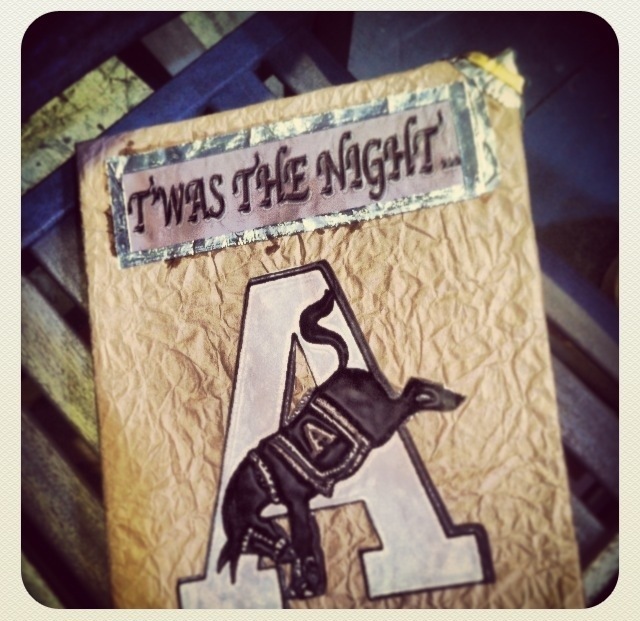 I first heard this version in 7th grade. I never imagined I’d be performing it in conjunction with news media for such a large audience. 8:05: We prepare to rehearse for the ceremony we’re participating in later in the morning. As a trombonist, I am in the front and literally leading those behind me. The band is divided into two sides of the armory. I am briefed on where to march and where to stop. 8:07: The band forms up. I have been shifted to the opposite side of where I was briefed. I have no certainty of where I’m marching or supposed to stop. I look confident and decisive, nonetheless. My line ends up in the correct spot. I am ready for the ceremony. 8:55: We are in place for the ceremony. There are several prominent folks scheduled to speak about the “Hiring Our Heroes” program. One of whom is Medal of Honor recipient Dakota Meyer. 9:20: Dakota Meyer takes to the podium. Moments before, the story of how he was awarded the Medal of Honor is told in great detail. It is difficult not to get choked up in the moment. Hero is a word that gets thrown around a lot, but I cannot think of a better example than Dakota Meyer. 9:30: The band’s performance of God Bless America marks the end of the ceremony. We are done with TV filming until noon. We are told to stay in the armory in case the plans change. Smart phones were invented for this sort of situation. 10:00: We learn that our next spot has been moved. We now have 10 minutes to get in place. I am suddenly quite relieved I didn’t sneak out to get a burrito. 10:10: We perform Americans We for our final spot. It was a very early, but rewarding morning. Afterwards: By the time I sat down to eat lunch, I had been up over nine hours. But I felt good knowing I’d been part of such an important event. I later heard from my mother and aunt that they saw me on national television. Not a bad day at the office! I should have gone to bed early that night, but instead I stayed up watching hockey. (What can I say? The Devils needed me.) 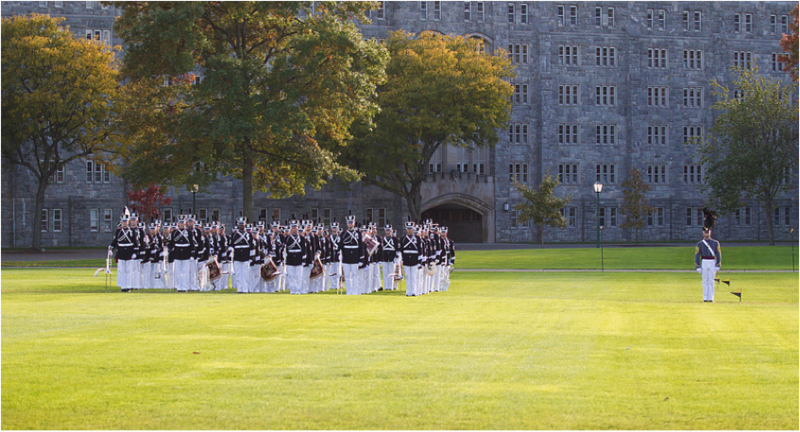 When I finally did hit the sack, I slept well knowing the West Point Band did a job well done.